Once the panels have been cut to final shape, they can be smoothed and prepared for gesso. I usually sand the panels with a moderate grit sandpaper, making sure that the edges are smooth. The moisture in real gesso sometimes causes the wood grain to swell, the amount depending on the species. 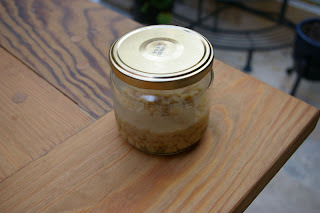 Because gesso is rigid, this can lead to cracking later on. To prevent this, the panels are rubbed down with alcohol, which raises the grain of the wood, Once dry the panels are given a final sanding. Now I can start coating the panels. First, the panel was given a few coats of size, made from hide glue. I used rabbit skin glue for this task. The glue was added to water in the correct ratio by weight, and allowed to sit over night. As you can see, it swelled considerably. The glue was heated until all of the pellets have broken down into liquid. I continue to only use warm water in a sink to heat my glue, a glue pot being overkill. Once liquified, the glue is passed through a sieve, and its ready to be used. Real gesso is a mixture of hide glue and an inert white pigment, that is porous. The ground is absorbent, so it readily bonds the layers of paint to the panel, while at the same time isolating the two. There is more than one suitable choice for this material. I have chosen to use calcium carbonate, in the form of chalk. Chalk from the Champagne region of France is one of the most pure natural chalks that can be found. I saved the leftover glue from sizing my panels, as a base for my gesso. The correct mixture involves adding chalk at 1.5 times this volume of glue. First the glue must be made hot, then the chalk was slowly added. I stirred gently, taking care not to do so too vigorously. Stirring gesso too enthusiastically will introduce tiny air bubbles into the mixture. Once these bubbles are on the panel, they cannot be filled or removed, no matter how many additional coats of gesso are applied. Once all of the gesso was been added to the glue, it was allowed to soak in for ten minutes. The panel are given a coat on each side, to seal them effectively. Its important to try to make the coats as even as possible. 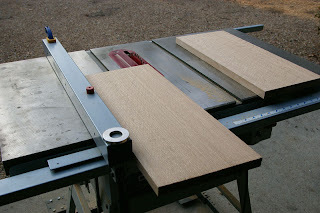 Gesso puts tension on the wood, and uneven tension could lead to problems later on. An equal number of coats front and back should minimize this stress. 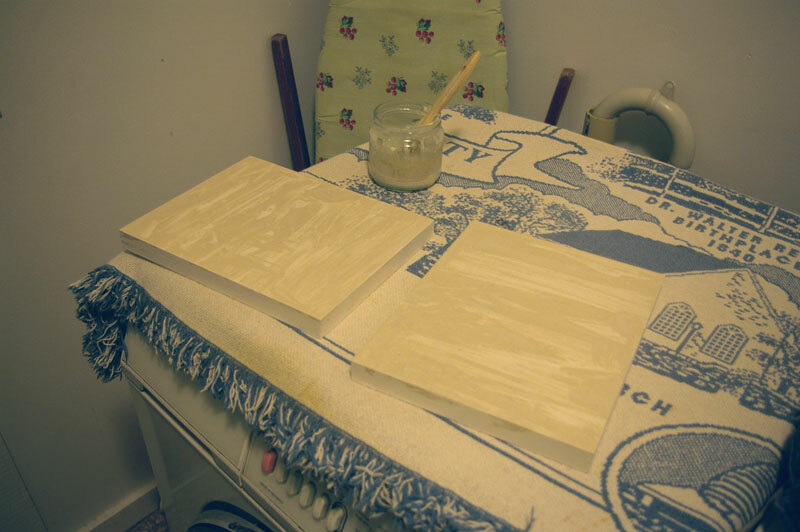 After a coating of gesso is applied, the board was put aside to dry. This lasted twenty minutes to an hour. Then the next coat was be applied and so on. Coats should always be applied in overlapping passes, i.e. a coat across the width of the board should be followed by a lengthwise coat. Five to ten coats should be sufficient to get a good surface. It is possible to get carried away, and produce a beautifully smooth surface. That would require many extra coats, followed by lots of sanding. Once all of the coats are applied and the panel is dry, there is one last step to prepare the panel. Raw gesso is very hard on brushes, and is too absorbent for oil paints. A final isolating layer needs to be applied to reduce this tendency. A thin layer of glue size is sufficient. Each panel should be given a week or two to dry, and then is ready to be used. Over the next few weeks I plan on making an assortment of panels for painting. As discussed in my post on painting supports, panels have a variety of pros and cons. I have come to the conclusion that overall they are the best kind of support for works of small to moderate size. For larger works, I will still rely on canvas. 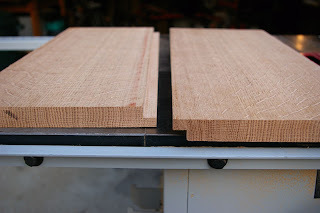 I recently located some furniture-grade, quarter sawn oak boards. These boards were kiln-dried, but had been aged 4-5 years. Oak was the most popular wood for use as a painting support in Northern Europe. It is a fine wood for use as a painting support, as a visit to any museum containing these pictures will demonstrate. 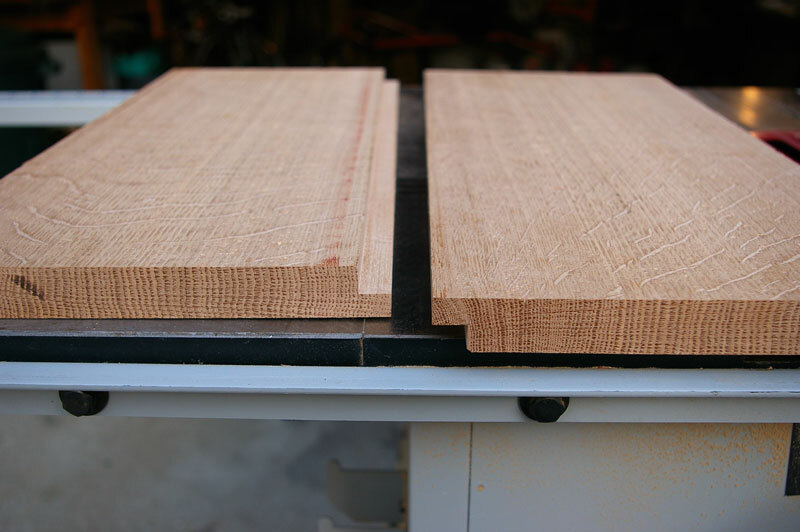 The boards were first cut to the right shape and size. Any final sanding or planing could be done at this time. A larger panel necessitated joining more than one board together. The lap joint I cut into the boards is a traditional and effective method of joinery. Both halves are from the same board, but have been flipped so that if warpage does occur, there should be a counter effect.